2012 will be coming to an end soon and I have been thinking about next year and what I hope to accomplish with my blog and research. This requires looking at the past year and what I have accomplished. 2012 had a few blog hiccups in it. For the first time since I started blogging I had two months where I didn't blog at all. Family commitments and life in general got in the way. I started a second blog, Journey to His Past, and decided to reduce the number of blog posts I wrote on this blog, but two months of no posting wasn't what I had in mind. I would like to get back to posting 2-3 times a week, every month in 2013. I set goals for 2012 and I am not sure if I want to do it for next year. My strengths are in education and organization. I accomplished all of the goals I set in these topics. I accomplished research, but I tend to go in other directions than what I set goals for. I like the freedom to research when new record sources and interests are discovered. There are no research priorities set. I plan to assess what research needs to be done and as time allows research a few family lines. For me, research is an ongoing process and to be tied to one specific research goal doesn't work. 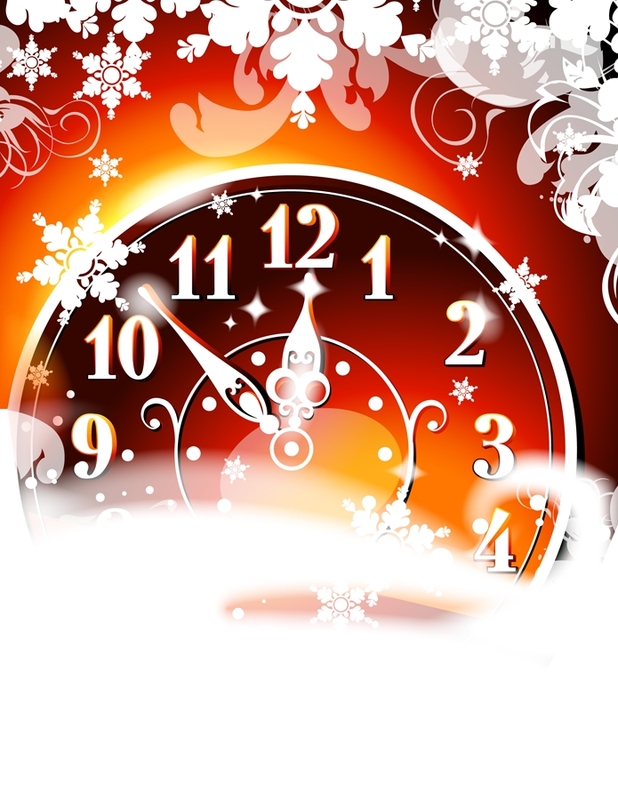 What are your plans for 2013? Do you set goals? If so, please share in the comment section. 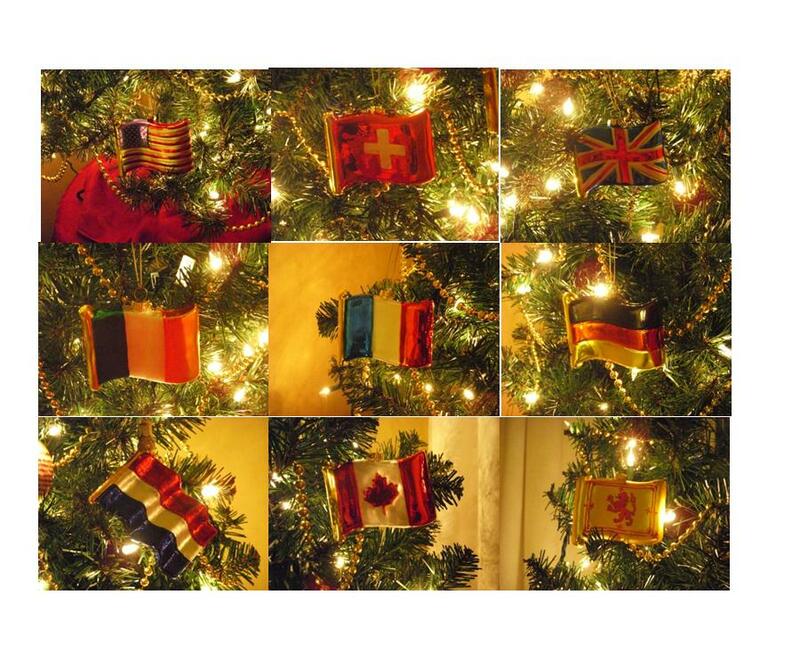 To see how to say Merry Christmas in many languages, click here. I have written 22 blog posts about Hattie's Bible in the past year and a half. I have no other records or family pictures to share from the Bible so I will close out this series with a few thoughts. Hattie's Bible has to be the number one greatest all time genealogy gift. I still remember the day I opened the box and the excitement I felt while looking at it. I imagine Hattie reading her Bible, recording important events in it and tucking cherished memories within the pages, all of these things that I found delight in discovering and sharing with my readers. I would love to give Hattie's Bible a prominent place in my home, but the 1882 Bible is in fragile condition. There is beautiful artwork in the Bible. The Lord's Prayer page is embossed and could be framed as a piece of art. I won't do that as I want to keep the Bible as I received it. I carefully removed the clippings and pictures stored in the Bible and put it away in an archival quality box for safe keeping. 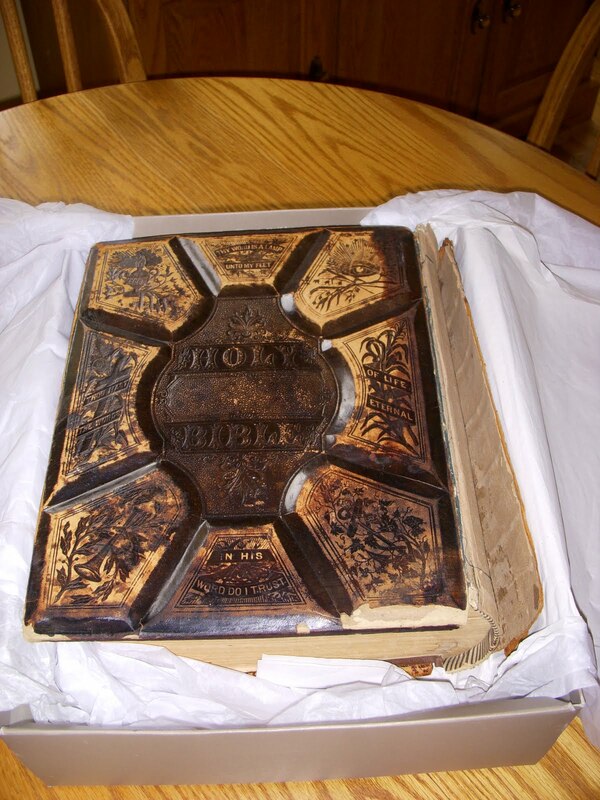 The excitement continued each month as I planned and wrote a blog post about Hattie's Bible. I found great pleasure in reading her marriage license, the newspaper article about her husband, Frank, being given a lighthouse position, and her letter from her son, where he talked about my grandfather, Harry. The pictures saved in the Bible were priceless. Pictures of Hattie as a young child, on her wedding day, her husband's picture at a young age, her parent's pictures-all pictures which have great meaning to me as a genealogist. I feel I got to know Hattie and her son-my grandfather through her Bible. I never knew my grandfather as he died before I was born. I never thought I would get attached to an object I was writing about, but I did. I will miss writing about Hattie's Bible. I will never forget the generosity of Mary Louise Blades and her daughter, Carol. They were determined that I receive the Bible. I hope the stories I shared go a long way in defining who Hattie was, someone I would be proud to call Great Grandma. Two years ago, I posted a birthday post on Kirsten's birthday. It was on my memories of the day she was born. Last year, I wrote about her first birthday. Today, I will celebrate her birthday with memories of 1985, her second birthday. Kirsten blowing her candles out with Dad and Mom's help. I remember celebrating Kirsten's birthday quietly at home. Kirsten's grandparents, Jim and Betty Leyndyke were there to help us celebrate. The cake was made by one of Kirk's students and given to Kirk as a gift, so we decided to use it as a birthday cake. It was chocolate with white frosting. Playing Western Town with Mom. Check out Kirsten's hairdo. During the day of Kirsten's birthday, I took her to the Elaine's Beauty Shop. Kirsten called it Vaseline's for some reason. I was going to have her hair trimmed. Elaine found out it was her birthday and braided it and sprayed it with sparkles. Kirsten loved it. Kirsten had beautiful long, almost black hair at this age. Gifts were opened after dinner and cake. She received the following gifts: magna doodle, western town(which I still have) and Tupperware Shape O, clothes, dish set, ironing board, iron, vacuum sweeper, ABC See n Say, Sesame Street Bert Puzzle, Big Bird Book, and Sesame Street Big Bird and Ernie figures. Playing with one of her gifts, later in the week. The vacuum actually worked. I wonder if Kirsten vacuums in a dress now. For as long as I can remember Kirsten loved to wear dresses. The blue dress above was a Polly Flinder's dress, which was popular for little girls at that time. The hand smocking on the front was indicative of Polly Flinders. Unfortunately, they no longer make Polly Flinder dresses. They were beautiful. The red dress she wore on the day of her birthday was a Healthtex knit dress. I remember spending many hours playing Western Town with Kirsten. We went through a few magna doodles too. They seemed to get stepped on for some reason. Kirsten loved helping me at this age and her gifts reflected that. It was a great day in December. Tonight would be the night that we would put our tree up and have our annual tree trimming party, if my children hadn't grown up and left us. How dare they have lives of their own:)? When my children, Kirsten and Travis, were growing up we would put our tree up the second Friday of December. We celebrated by having a tree trimming party. I would put the tree up in preparation for their help that night. I would make snack-like food and we would make tree trimming a festive time. 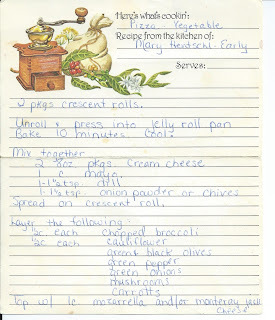 One of the recipes I always made was Vegetable Pizza. Sometimes I would make it in a tree shape or a wreath shape, or sometimes just cut it in squares. Last week, my son emailed me and asked me for the recipe. He and his girlfriend were putting their tree up and having snacks. (sniff, sniff) I was so pleased that he was continuing a tradition that started when he was young. I wrote about our Tree Trimming Party in 2010 for Advent Calendar of Christmas Memories. Recently, I wrote a Motivation Monday post about receiving this picture. A cousin, Hannah, found me through my blog and emailed me. She offered me a copy of Valentine and Nancy Graf's wedding picture, if I would like it. WOULD I LIKE IT? Yes, Yes, and Yes! Hannah's great grandmother, Nina Graf Johnson, and my grandmother, Daisy Graf Fredrick, were sisters. Thank you Hannah, for reaching out to me and sharing a treasured picture with me. Valentine Graf was born 14 December 1865 in Amboy, Miami, Indiana, United States to Casper Graf and Mary Wrightweasner. He lived his early years in and around Miami County, Indiana. Sometime between 1900 and 1905 he moved to Brethren, Manistee, Michigan. He lived there until his death, 13 January 1933. Nancy Mast was born 23 February 1871 in Somerset, Somerset, Pennsylvania, United States to David Samuel Mast and Anna Nancy Livengood. She lived in Somerset County, Pennsylvania, Holmes County, Ohio, and Miami County, Indiana before her marriage to Valentine Graf. She moved with Valentine Graf between 1900-1905 to Brethren, Manistee, Michigan. Nancy Mast Graf died in Dickson Township, Manistee, Michigan on 18 January 1908. I have never seen a picture of my great grandmother, Nancy Graf. The picture I had of Valentine Graf was from later in his life. 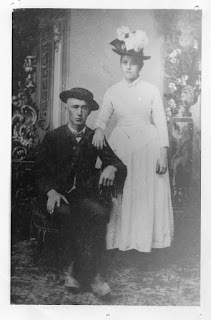 I now have pictures of all eight of my great grandparents, something I never thought was possible. Now all I need to do is find a place for it on my genealogy wall! Life gets in the way sometimes and blogging has taken a back seat over the last month or so. But, when I was contacted by a 'cousin', who found me through my blog, and was offered a picture of my great grandparents on their wedding day, I knew blogging was important to me and I had to find a way to incorporate it into my daily tasks. There is no greater motivation than knowing that others are reading your blog. Better yet, is that family members are reading it. I was so thankful that someone I didn't know took the time to contact me and send me a picture. I was ecstatic as I had never seen a picture of my great grandmother. I will be posting more on her later this week. Here are a few ways that I try to make blogging easier. I use an editorial calendar. I print, or you could keep it electronically, a blank calendar page to plan and write blog posts on. I use my Roots Magic software and prepare a monthly calendar report to check for upcoming anniversary (birth, marriage, death) dates to blog about. I use geneablogger daily themes to prompt me for blog posts. I try to do prompts such as Sunday's Obituary, Military Monday, Tombstone Tuesday, Wedding or Workday Wednesday, and Those Places Thursday to name a few. I use recent research finds and look in my genealogy folder on my computer for pictures, stories or documents to share. I try to read other genealogy blogs to stay up on trends in genealogy and gather ideas for future blog posts. I keep a notebook where I jot down ideas as I come up with them. 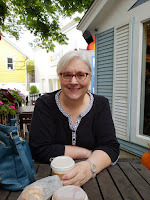 I have a few blog posts that I do as a series (ancestor biographies, Hattie's Bible, Civil War Pension File, etc) and I list what I have posted to keep track of it. This helps plan for next steps, too. I try to blog 2 to 3 times a week, but that isn't set in stone. I sometimes accomplish more and sometimes less. I accept that I am not writing a book, I only need to share what I know. It can be a couple of paragraphs or just a picture with explanation. What tips do you have to make blogging easier? Please leave a comment. What is on your genealogy wish list this year? Every year I put a couple of genealogy related items on my wish list for my family to buy me. I have been very fortunate the past couple of years. My husband is still in my good graces for the year he bought me a Flip Pal! My parent's bought me Michael J. Leclerc's Genealogist's Handbook for New England Research last year. This year was no different. Here are the genealogy related items I added to my wish list this year. Legacy Quick Guides- New York Genealogy and Land and Property Records. Flip-Pal DCS 3.0 Digital Creativity Suite DVD-to go with my Flip Pal scanner. I can just imagine all the creative things I can do with it. Digital Pursuits 18 x 12 Copy Stand-this would allow me to take pictures from books, documents, etc. Plus, I would like to take pictures of my children's art work which I saved from their childhood. Sunpak Clamp Pod Pro-I watched Mary Hill's Legacy Webinar,"Use Your Digital Camera to Copy Records"and she uses this to take pictures from a microfilm reader. I have researched at places where this would have been awesome. Courthouse Research for Family Historians Book by Christina Rose-My experience with courthouse research is limited and I love to know what I am doing before I get there so this book would help me. My Brave Mechanics: The First Michigan Engineers and Their Civil War Book by Mark Hoffman-My great-great grandfather was a member of this company. It is a very well written book detailing the service of this group. Money-I would like to go to FGS 2013 Conference in Fort Wayne, Indiana, which is 90 miles from me. Money to help cover the registration cost and hotel would be wonderful. What is on your wish list this year? Please share in the comment section. It was the fall of 1978 and my senior year at Western Michigan University, Kalamazoo, Michigan. As an education student, it was time to make a decision on where I would do my student teaching. I wanted a new experience and decided not to stay in the Kalamazoo area to do it. My first choice was High School Home Economics in Frankenmuth, Michigan, but when I got my assignment I was assigned to Bangor Junior High School in Bangor Township, Michigan, near Bay City, Michigan. I did get Home Economics, so that was good. I didn't realize what a big move that would be at the time. I had to find temporary housing in a short (two months) time, move, and be ready to student teach by January. Luckily, the school district had a list of places to rent for student teachers. I made a few calls, set up appointments, and headed to Bay City to check them out. I found a women who had a bedroom to rent in a two bedroom apartment within walking distance to the school. I liked the apartment and felt it was a good fit, so I signed up for that. During Christmas vacation, I moved to Bay City, Michigan eager to start my student teaching. The first three days that I was suppose to report started as snow days. It was during these three days that I realized I may have made a mistake with a roommate. I discovered she was an alcoholic who lied when people would call me. She said I didn't live there and even told me school was closed, when it wasn't. It only took me until the weekend to realize I needed to move. My parents had friends in the area and I moved in with them while I looked for another place. It only took a couple of days. The school removed the first landlords name from their list due to this. I found a wonderful older woman to live with. Her husband had recently died and she decided to offer her extra rooms to others. There were two other young women who lived with her. She was a sweet, caring lady. She redecorated the room for me, it was bright and fresh. I loved it. She cooked our meals for us, it was like living with a grandmother. My time at Bangor Junior High School was wonderful and my living arrangements contributed to that. I learned how to be a teacher. I learned to love junior high school students and preferred teaching junior high years later. I don't have any pictures from this time, but the memories are still there. I only lived in Bay City for four months, but I grew as a person and a teacher during those short four months. In November, my husband and I took a trip to Troy, Michigan. Kirk had a conference and I decided to tag along for a weekend getaway. One that would include a little genealogy, of course. The hotel we were staying in was about a mile from White Chapel Memorial Park Cemetery; the cemetery my Uncle Hank and Aunt Mabel were buried in. Before we left home my husband asked me if I wanted to pack my cemetery bag (isn't he a dear to remember?). My reply was, "No, it hasn't been that long since they died, I think I will be fine." Ha, famous last words. I checked out of the hotel, attended the luncheon and went to the grave site Of course, I didn't change my clothes from the luncheon, there wasn't a need right? I was only going to take a couple of pictures, pay my respects, and leave. This is what I saw when I found their grave site Not bad, I could just brush the leaves off and all would be good. What I found when I removed the leaves was that the grass had grown over the edges of the stone about 2 inches all the way around it. At this point I was thinking, I should have brought my cemetery bag. I started to tear away at the grass and quickly decided it wasn't going to work. Luckily, I had my phone with me and I brought the cemetery up on the map and searched nearby for hardware stores. Bingo, there was one just down the street from the cemetery. I headed there and found the tools I needed (gloves, trowel, clippers, whisk broom and wipes for my hands). A quick stop at a convenience store for water and I was back in no time. While I am on my hands and knees, in good clothes, I am talking to my Aunt and Uncle. I have very fond memories of them. The cleaned up stone is below. Near Hank and Mabel Glover's stone is a veteran stone for my Uncle, this one didn't need as much clean up. I barely made it back in time to pick Kirk up, but the time I spent with the Uncle Hank and Aunt Mabel was one that I was happy to do. Francis Henry Glover and Mabel Louise Glover are buried in Section 15618, Spaces 13 and 14, Block M Near the Korean War Memorial. Source: Manistee News Advocate-Manistee Daily Advocate, (Manistee, Manistee, Michigan), 26 October 1963, Front page headline and column 8, microfilm owned by Manistee Public Library, Manistee Michigan; Manistee County Historical Museum, Manistee, Michigan. Michael Fredericks, a 15 year old Kaleva Norman Dickson High School Freshman was killed last night when he and three classmates who arrived early for a Freshman hayride unhooked a tractor from the wagon and rode on it back of the school. The tractor overturned pinning Fredericks under it. 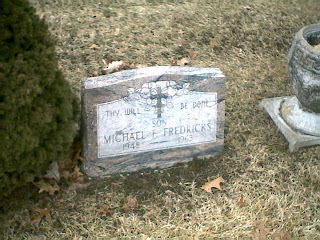 He was the son of Mr. and Mrs. Otto Robert Fredericks of Coates Hwy., Brethren. State Police said Fredericks and three classmates were riding on the tractor at approximately 6:30 p.m. when it rolled over. They said Bert E. Clements, 15 Route One, Brethren, said he was driving the tractor and that somebody grabbed the wheel, causing it to turn sharply. He told State Police that the next thing he knew the tractor 'flipped' over and Michael was pinned underneath. He said he did not know who had grabbed the wheel and State Police said none of the other boys knew either. Police said they believed the tractor was moving at a fairly fast rate of speed for a tractor and that when the wheel was turned it went all the way around, causing the tractor to roll over. The others managed to get clear, but Michael was pinned underneath with the tractor upside down on top of him. The other boys said he was alive for a while, but they were unable to get him out. A wrecker was called from Onekama and it lifted the tractor off the victim so he could be pulled free. The other two boys on the tractor besides the driver and Fredericks were Lawrence Lempke and Anthony Skocelas, both 15 and both of Route Two, Wellston. The tractor is owned by John Urka, Route One, Brethren. The hayride was to have started at 7:30 p.m.
State Police are continuing to investigate the accident. Funeral services will be at 2 p.m Monday at Trinity Lutheran Church of Onekama with Rev. E. A. Mueckler officiating and burial will be in Brethren Cemetery. The body will be taken from Terwilliger Funeral Home in Kaleva at noon Monday to lie in state at the church until time of service. Michael Fay was born March 27, 1948 in Manistee, and besides his parents, he is survived by three sisters; Julie, a student at Central Michigan University in Mt. Pleasant, Lori and JoEllen, both at home; two brothers, Robert and Steve, both at home; and four grandparents, Mr. and Mrs. Virgil Nelson of Onekama and Mr. and Mrs. Otto Fredericks of Brethren. Today marks the 49th anniversary of Michael's death. I wanted to memorialize Michael, but didn't want to add any pain to his brothers and sisters who are still living. I emailed his sisters and the one who replied said she was okay with it. She asked for a copy of his obituary and I sent it to her. Brethren, Michigan is a very small four corner type of town. I can imagine the shock that must have went through the town and school community. Michael was a freshman and had his whole life ahead of him. My thoughts and prayers are with his three sisters, and two brothers and numerous nieces and nephews as they remember Michael, today. This week is the anniversary of the death of my cousin, Michael Fay Fredricks. Michael was just 15 years old when he died in a tragic accident. 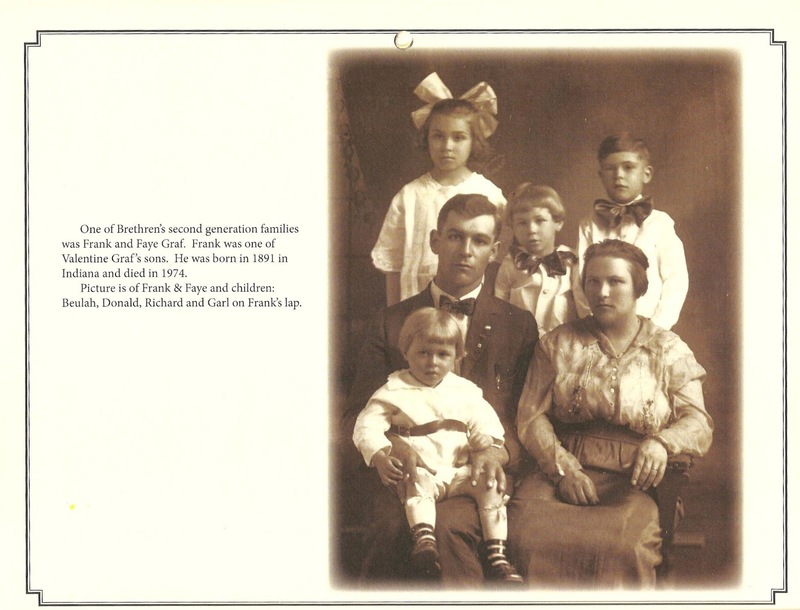 "One of Brethren's second generation families was Frank and Faye Graf. Frank was one of Valentine Graf's sons. He was born in 1891 and died in 1974. Picture is of Frank and Faye and children: Beulah, Donald, Richard and Garl on Frank's lap." 103 years ago today (21 October 1909), Ernest Franklin 'Frank' Graf and Faye Inez Keck were married in Brethren, Manistee, Michigan. Frank was born 13 August 1891 in Indiana to Valentine Graf and Nancy (Mast) Graf. Frank moved to Brethren as a young boy with his family. Faye was born 2 June 1894 in Kalamazoo, Kalamazoo, Michigan to Jacob and Martha (Winger) Keck. Frank and Faye had four children: Beulah Martha, Richard Franklin, Donald Leroy, and Garl Ernest. Frank and Faye both died in 1974 in Pontiac, Oakland, Michigan. My husband and I painted our living areas this summer a rich, warm, chocolate brown. Upon completion, my eyes rested on the hallway wall to the bedrooms. It was the perfect place for a gallery wall. The average person would have looked for art prints to display. Not me, I decided to hang family pictures. With a little help from Pinterest, a project was born! I went through my family pictures and decided which ones I wanted to hang. I wanted to show the Leyndyke and Glover sides of the family. I narrowed the final selections down to 29 photographs, one marriage certificate and one FAMILY letters hanging. Here is the end result. I ordered prints to frame from Walgreens. Then, I took advantage of a Michael's sale and bought a few frames. I spent days rearranging the pictures on top of two six foot tables. Once I was happy with the arrangement I turned them upside down, placed wax paper on top of them, and marked where the nail needed to go. Kirk nailed the wax paper to the wall, leveled it, and pounded the nails in for me. He tore off the wax paper and hung the pictures. The wax paper was a great way to keep everything in order. I only made a couple of mistakes, a couple of pictures had to be moved up and one nail was in the wrong position. I am very happy with the final project. I like the daily reminder of my ancestors. It helps me to remember that I have a lot to be thankful for. Here are the Glover family pictures on the wall. FAMILY-it is what it is all about! Wondering what Leyndyke pictures I chose, check out my other blog, Journey to His Past for pictures. Don't you love it when you can add another branch, or in this case twig, to your family tree? I do. 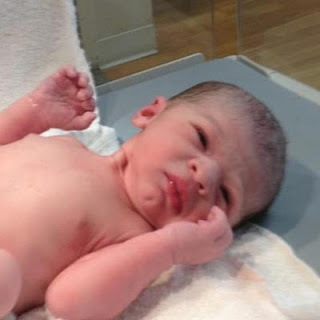 My niece, Bree, delivered a healthy baby boy last week, 10 October 2012, making me a great aunt for the third time. I was helping my parents clean their house this summer, when I decided to take the books off of the wall unit to dust. Imagine my surprise when I found my dad's high school yearbook. I knew he was an athlete and the sport's editor of his high school newspaper, but I didn't know everything else he participated in. 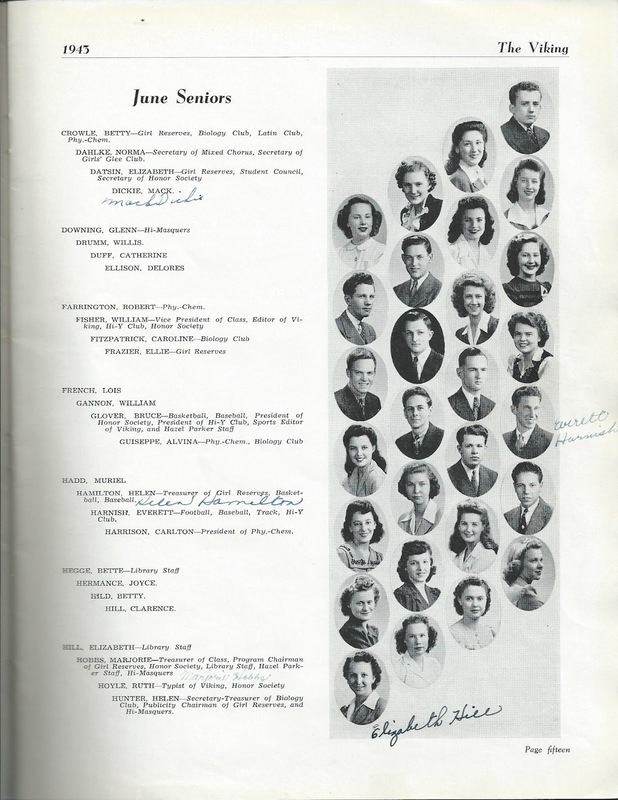 I borrowed the yearbook and have been scanning the pages. 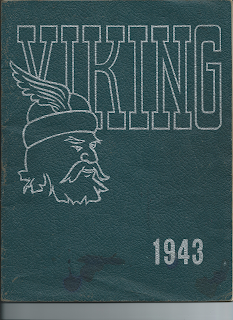 My father, Bruce Glover, was the Sports Editor for "The Viking", the school yearbook. He is in the second row, first one on the left. My dad always said if he hadn't gone into teaching he would have pursued a career in sports journalism. 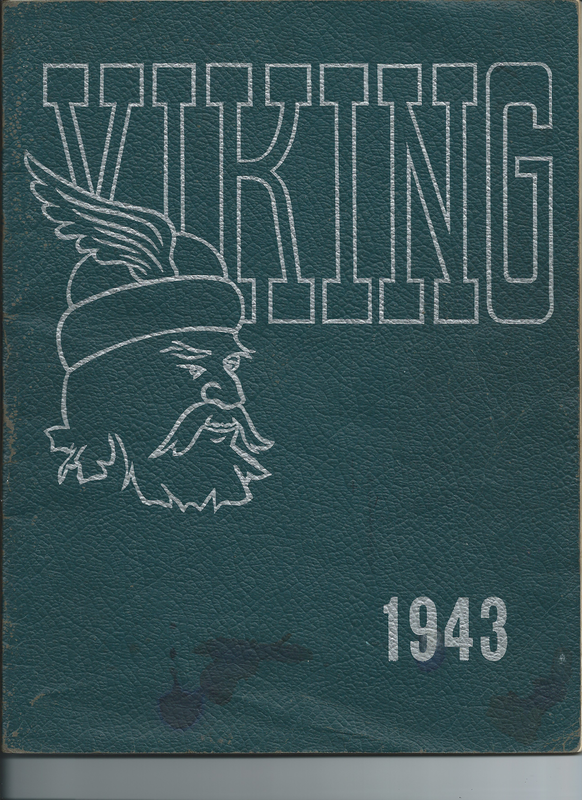 Hazel Park High School, Viking, (Hazel Park, Michigan, 1943) page fifteen. 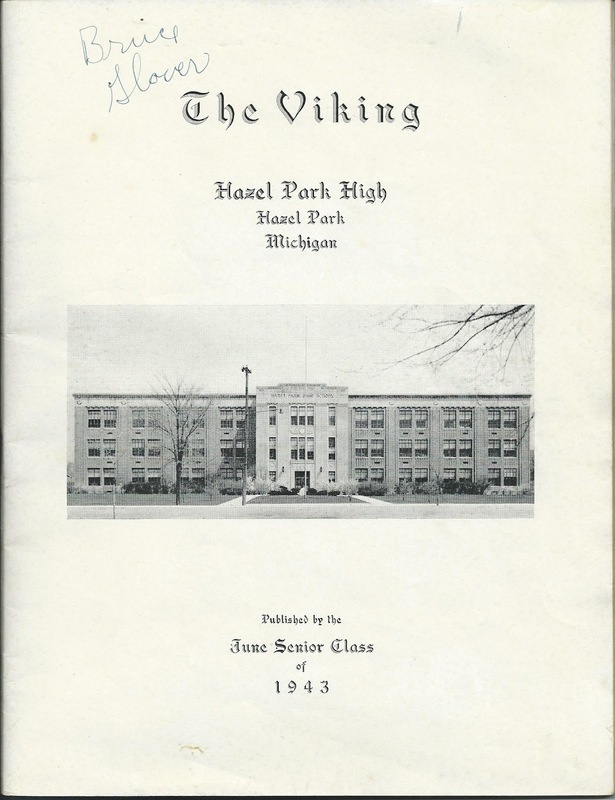 Hazel Park High School in Hazel Park, Oakland County, Michigan had a January and a June graduating class. My dad was in the June class. 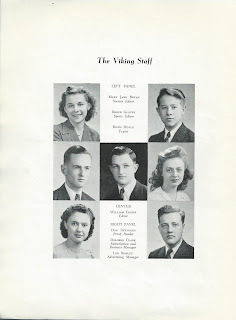 He can be found on page fifteen, fourth row, three from left. 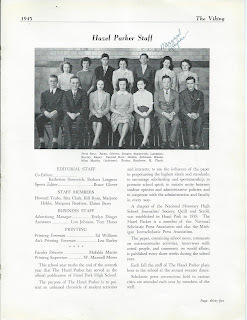 Activities he participated in were Basketball, Baseball, President of Honor Society, President of Hi-Y Club, Sports Editor of Viking, and Hazel Parker Staff. Anything related to sports would not have surprised me, but President of National Honor Society and President of Hi-Y Club did. I guess I just figured he was so absorbed with sports most of his life that he wouldn't be president of a club, let alone two. Who knew? I had never heard of the Hi-Y Club before and for those of you who grew up in the 60's and 70's it isn't that! The Hi-Y Club is a Christian Young Men's Organization. The club's purpose was for "creating, maintaining, and extending throughout the school and community high standards of Christian character." I don't know why this surprised me because my father has always been a great role model. Whether as a father, teacher, or coach he modeled high standards of character. 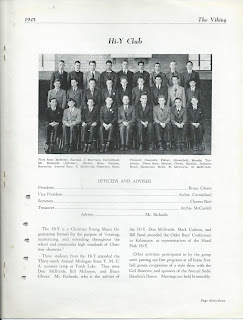 The Hi-Y page of the yearbook also told me that three students, Don McIlvride, Bill McIntyre and Bruce Glover attended the Michigan Y.M.C.A. summer camp at Torch Lake. I can imagine the fun these three had as they were all friends. 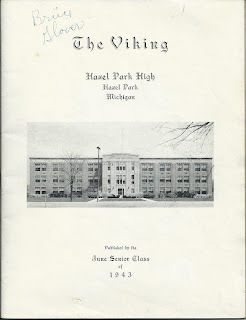 Hazel Parker Staff, Hazel Park High School, page thirty five of the Viking. 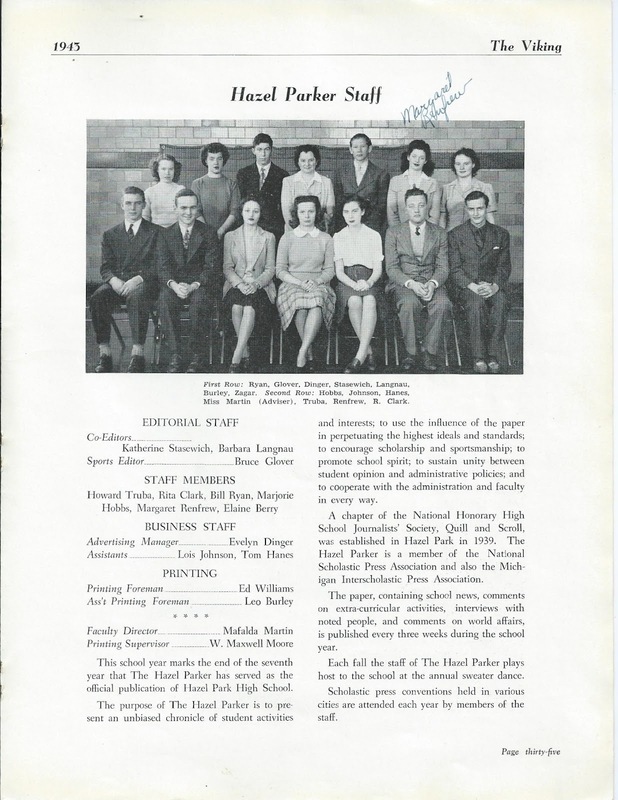 The Hazel Parker was the school newspaper, it chronicled the activities of the students. My dad served as the Sports Editor and this came as no surprise to me. I have heard my dad talk about being a sports editor. Also, during this time he worked for the Hazel Park Palladium, the local Hazel Park weekly newspaper. What did he do? You guessed it, sports editor. I will share my dad's sports participation in a future post, but I have one last surprising thing to share. 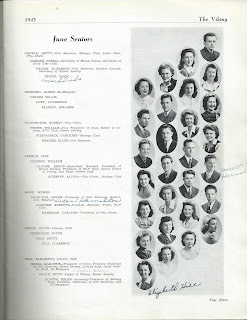 The June Class Will was included in the yearbook and here is what it says: "Shirley Hyde and Bruce Glover will their inconspicuous romance to Donna Martin and Lawrence Longman, who are taking theirs to heart." Sounds like Dad had a crush. Here is what Dad says about Shirley. The one girl that I always had eyes for from 8th grade on was Shirley Hyde and I would talk to her when occasion presented itself but never actually dated until my junior year when I got up enough courage to ask her to a movie. I dated her on and off and by end of my senior year we were dating steadily. I didn’t know how to dance and wasn’t particularly interested in learning but did take her to the prom in our junior and senior years. I guess I got out on the floor and stumbled around a little and imagine she was completely bored with the whole thing. When I was in the service I corresponded with her regularly while in training and I guess you could say I was in love or thought I was. After going overseas the letters stopped coming and stopped altogether and when I got home I found out she was going steady and I never saw her again. Do you have an ancestor's yearbook? What surprises did you discover? View two webinars per month. Finish the Glover surname file labels, using Family Roots Organizer System. Completed prior to April. Add information received from a Glover researcher to my Roots Magic software. Research Goals-Incomplete, so no brownie points for me. Education Goals-I was pleasantly surprised that I viewed as many webinars as I did. Thank you Legacy, SCGS Jamboree 2012, and Looking4Ancestors for providing excellent educational opportunities which help me grow as a genealogist. Thank you also to the excellent webinar presenters who take their time to develop and present these. Organization Goals-I can't take any credit for these being completed the last six months. Luckily, I completed those before April. If anyone saw the floor of my office right now, he/she would wonder if I had any organizational system at all! OK, I will share it with you; it looks like I need to get scanning! This is only part of what is in the office. I have a tub to the right of my desk and more on the other wall. Hopefully, this assessment will motivate me to work on completing my goals in the next two and a half months. I hope you have a successful next couple of months with your goals. Where in the World is Hattie Fenn Glover? One of the first records that a genealogist looks for when starting their genealogy research is the census records. I am compiling that information for an ancestor in table format, once a month. This month shows where Hattie Fenn Glover can be found in seven United States Federal Census.